Technically this album is called UHF Original Motion Picture Soundtrack And Other Stuff, but that's a lot to write in the title of this review considering I'm already taking up a lot of room noting this is from the box set. This is one of my favorite Weird Al records and in some ways marks the end of an era for Al's releases, at least the way they impacted me. This was probably the last Weird Al record that I loved from start to finished and I actually know all of the original songs that were being parodied. Once Off The Deep End came out, there were a lot (and I mean A LOT) of parodies on his albums that I had no idea what the originals were about. 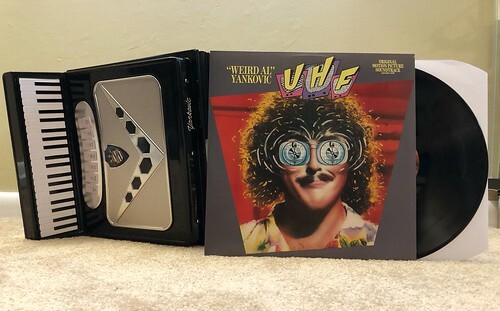 UHF had parodies of songs I knew like "Isle Thing" ("Wild Thing" by Tone Loc), "She Drives Like Crazy" ("She Drives Me Crazy" by Fine Young Cannibals) and "Spam" ("Stand" by R.E.M.). "Spam" in particular is an absolute joy to listen to. It probably helped that I knew the original so well from it being the theme song to the TV show Get A Life. Al's originals are also top shelf this time out. The title track is a super catchy rocker. "Attack Of The Radioactive Hamsters From A Planet Near Mars" is a worthy sequel to "Slime Creatures from Outer Space." And "The Biggest Ball Of Twine In Minnesota" ranks as one of my favorite Weird Al songs ever. Some say "Albuquerque" is his epic masterpiece, but for me I'll take the nearly seven minute long opus about a trip to Minnesota every time.